Long gone are the May days of torrential down pours. Bring on the mid afternoon swims, sunscreen slathered skin, and parks swarming with Austinites eager to soak in the delayed summer sun. 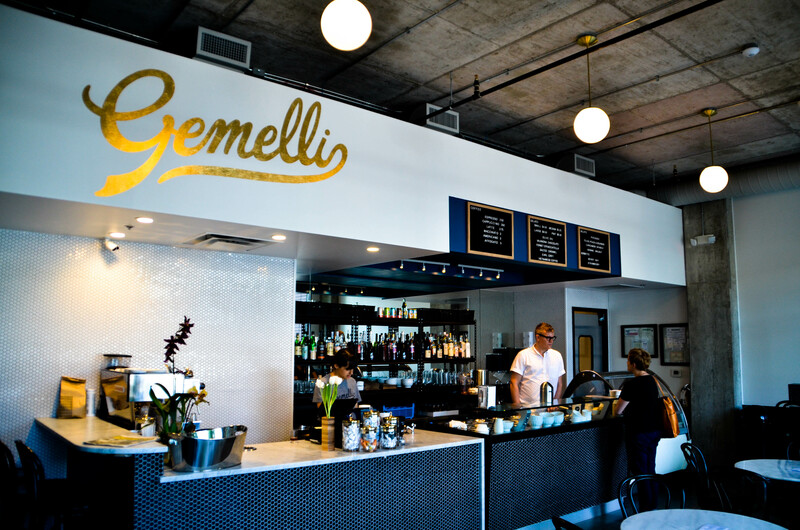 No one could be happier about the upcoming heat than Andy Sabola, owner of Gelateria Gemelli. 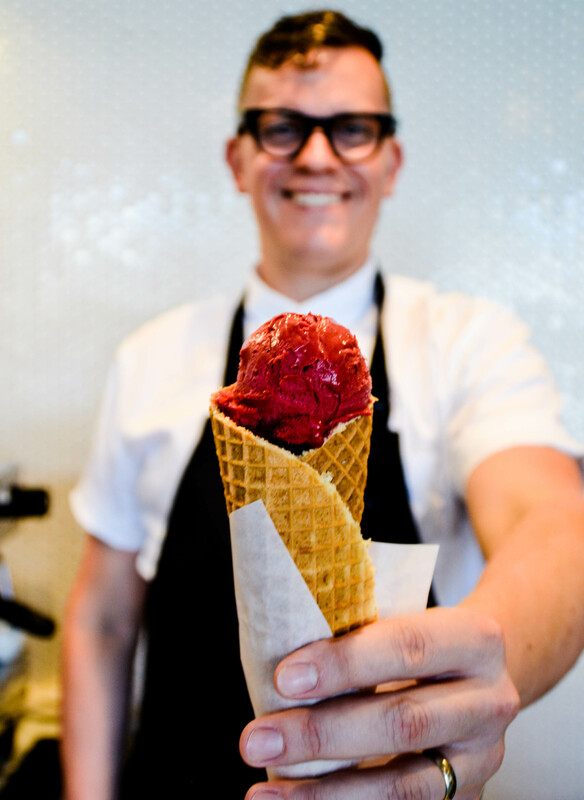 Gelato has long been a means of relief in the sweltering Italian summers and Andy plans on bringing that sweet relief through his delectable gelato and amaro pairings. On the menu currently is a blackberry bay leaf sorbet that is as tart as it is vibrant. Rachel, an employee at the gelateria, recommends pairing the sorbet with the olive oil gelato- a dense, creamy, salty gelato that compliments the brightness of the sorbet and lets the bay leaf’s herbal notes mingle with hints of savory olive. Andy and his partner arrived in Austin in 2009 from Boston, MA knowing that he wanted to eventually make the switch from a career in finance to owning his own business. In 2014 Andy and his friend Meghan Irwin travelled to Italy for a full month to learn the Bolognese art of gelato making. 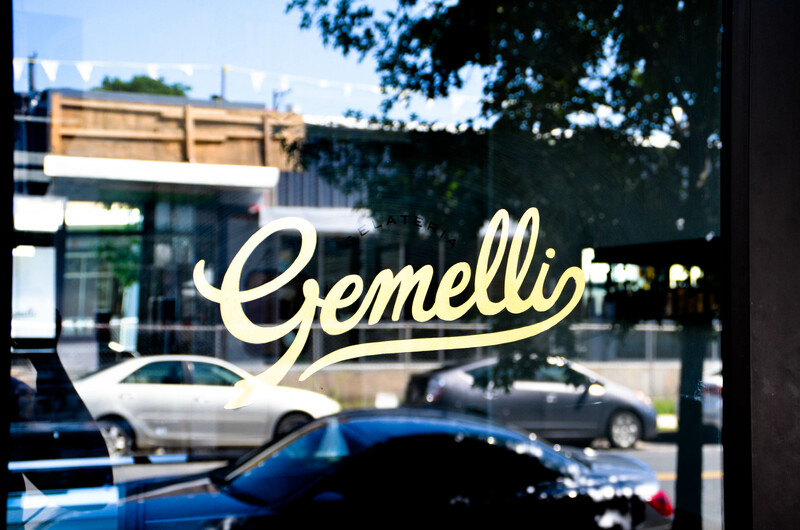 After some in depth classes (and seriously delicious research ) they returned home to Austin and began development for what is now Gelateria Gemelli- a gelato shop that focuses on remaining simple and thoughtful in their flavor profiles- offering espresso and amaro pairings, negronis and beautiful design. Tell me about your favorite gelato experience to date. My favorite gelato experience was also an inspiration to the business plan. It was in Brooklyn at Roman’s where they make this chocolate sorbetto that is soooo good. It’s like the best chocolate pudding of your life. They paired it with amaro nonino, which inspired me to do amaro pairings. Gemelli will have a full liquor license which I’m really excited about. It’s not like you can go in and get a gin and tonic, but you can have an amaro that pairs with the gelato. Amaro is a digestivo which Italians drink after dinner- the combination of gelato and amaro is magical. I’ve never had amaro before can you describe it? Have you ever had Fernet? Fernet is an amaro. Amaro is an herby, bitter, alcoholic drink. Fernet is an extreme example, there are others that are more mild- it cuts the fat, cuts the sugar and pairs perfectly with creamy gelato. Awesome! So on the menu will you have some suggested pairings with each flavor? Yeah! I want the staff to understand what the flavors are and how to pair it and why they go well together and be able to make those suggestions. I want them to do their homework so they can better educate the customer. We will have negronis and aperol spritz and this drink called Scroppino which consists of a scoop of lemon sorbetto with vodka and prosecco then it’s stirred in a glass- it’s perfect for that summer night drink/dessert. That sounds incredible! Do you get a lot of late night traffic? Yes! We are open until 10pm on weekdays and midnight on weekends. It’s been great to offer a date night destination. It’s the perfect place to come after dinner or when you’re just not quite ready to go home yet. What’s your most exciting flavor to give to Austin? They’re super simple. We went to Italy thinking we would do all of these complex flavors but the best flavors we had in Italy were simple ones like walnut and pistachio. It’s more about pairing things like fig and walnut or dark chocolate and cherry. It’s about juxtaposing the flavors rather than putting too much into the gelato. We’re starting with twelve really simple flavors- nut based, herb based, and fruit that’s in season. I’m obsessed with lemon curd gelato. We’re also doing these really awesome gelato pops. Imagine riding your bike back from Barton Springs on a hot summer day and grabbing a gelato pop- that’s basically my ideal summer Saturday afternoon. We’ll also have a gluten free cone with lemon zest in the batter and chocolate on the bottom- I could eat the cones by themselves. What was the choice like to make the jump, go to Italy and learn gelato? I had a really bad day in Boston in 2004. I went downstairs to the bodega and there was the New York Magazine, and the title article was “Change Your Life”. It went through all of these different things that people did to make these drastic changes in their lives. For instance, one person was an accountant and they took these steps to open a wine shop. Another person was a consultant and they opened a gluten free bakery. They quit a well defined career path to follow their passions and that really stuck in my mind. Then it was years before I put it into action. I went to grad school and got my MBA, and my final project was a Profit and Loss Statement for a bakery. What’s been your career up to this point and what made you want to step away from it? I’ve been in finance since 2000 when I fell into it by accident. I’m a musician and I was working in a phone bank at an entry level position. I climbed the ladder a bit and moved around some. I’ve been traveling 40 weeks out of the year for the past ten years, so I’m a little burnt out. I missed my friends here and I felt like I wasn’t seeing enough of Austin and experiencing it the way I wanted to. It goes back to quality of life- I want to ride my bike everywhere instead of get on a plane every Monday. Will he have any part in the business? No. He’s not allowed [laughs]. We have very different philosophies on customer service. I think a lot of couples I’ve known that go into business together have shown that it goes badly. Your partner is the easiest person to take stress out on and I want to keep a bit of romance alive somehow. We could probably do a different kind of business together but not a restaurant business. Does it make you nervous now being in the public eye as a business owner while being openly out and proud? No. What’s funny is I voted more and protested more here in Austin than I ever did in Massachusetts. I think because we are so outnumbered here in terms of allies, that it matters more. If some kid from Midland moves here, I want him to know that he has places to go and get a cappuccino and not be bothered. It makes me more adamant to be out and heard. Has being an openly gay man affected your business in the past or in the present? Yeah, there are times where I’ve experienced homophobia and it would have been mission critical if I had spoken up about it. For example we were at dinner with a client in Houston, and this woman who was maybe in her mid-sixties- she was a financial advisor- kept asking questions about my wife. I avoided the questions, and then she finally nailed me down and asked “What’s your wife like?” and I responded “Well, she’s 6’4”, 240 pounds and wears a size 13 shoe- kind of hairy” and she thought I was joking and then sort of put it together. She made a comment that she really thought being gay was a choice. It’s weird now, because as a white gay man, I’m mainstream. I’m the norm. And if that’s weird to them, I need to be an advocate for the people on the margins. That’s our job. That’s part of what I like about Austin is that it steps out of the homo-normative- the Cheer Up Charlies crowd and Queer bomb, I much prefer it over gay pride. I like that whole rainbow of all the flavors. Have you had any opportunities in your business venture to advocate for people on the margins? It was really interesting going over things with my architect. Until recently businesses were required to have men’s and women’s bathrooms. I couldn’t understand it. They’re both single stall, why can’t we all pee in the same place? Also, I don’t want any trans folks to have that awkward moment. I don’t know where they might be in their transition and I don’t want anyone to be uncomfortable or harassed because they’re going into one or the other. Our community is so much more casual about restroom use. I was really irritated that it was part of the code to have separate bathrooms. But City Council just passed gender neutral bathrooms. It’s a really big deal and I’m thrilled to just write “WC” on our bathroom door.